Ankle holsters (also called “boot” holsters) are much like they sound as they are gun holsters designed to be worn on the ankle. History seems to indicate that this style of holster was born in the Old West where small guns were routinely stored in the boot for emergency use. They became more mainstream in the late 1950’s and early 1960’s, when law enforcement officers of that era started carrying a back-up pistol (usually a snubby revolver) in an ankle holster. Concealability – A boot holster can be a great option if your body type, dress, and/or preferred clothing for a situation won’t allow you carry in a more typical method (IWB, OWB, pocket, etc.). This is especially true if your occupation limits your clothing options in situations such as health care professionals who have to wear scrubs or pilots who have to wear a flight suit. In some of those scenarios, an ankle holster may be one of the few CCW options that might work. On the other hand, certain types of pants (think leggings or the “skinny” jeans) won’t have enough space in the pant leg to conceal the holster and may interfere with access when you try to raise the pant leg to draw. The Draw Process – Unless you are amazingly gifted, it usually takes two hands to draw from an ankle rig. The weak hand is used to pull the pant leg, and the weapon is drawn with the strong hand. That process becomes even harder if you are trying to defend yourself physically or trying to run (we’ll get more into that later). With the exception of a few scenarios (which we’ll get to later), drawing from an ankle holster requires kneeling or bending down to lift the pant leg and accessing the holster. If you are a healthy person, then this type of physical activity probably isn’t an issue. However, if you have back, knee, or lower body issues, then drawing from the ankle could be a challenge. On the other hand, an ankle rig can be an excellent option if you spend a great deal of time seated in a vehicle or driving as the holster is fairly easy to access from the seated position. Accessibility – Given the bending and/or kneeling that is involved, drawing from an ankle holster potentially takes more time than drawing from a holster on your belt (in most cases). However, with practice, a shooter can get very proficient with the draw movement. Also, given the specific physical actions required during the draw, it’s next to impossible to draw from an ankle holster unless you are stationary. Since most current firearms training teaches one to move off the line and/or try to take cover, the ankle holster poses a potential issue as it becomes difficult to draw and move at the same time. That’s not to say that it can’t be done, but it’s more difficult that drawing from a typical strong side holster. Anything much larger than those can work, but become more challenging. Most ankle holster models manufactured today consist of a holster attached to a harness of some type that is worn around the ankle. The harness typically attaches to the calf via a strap that uses a buckle type scenario (like what you commonly see on belts). 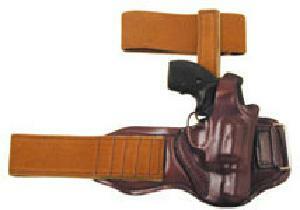 Most also feature a thumb break for added retention and a stabilizer strap or belt that mounts higher up on the calf. Most CCW experts recommend wearing the holster on the outside ankle of the shooting hand, although this can lead to bumping the handgun into things until you “learn” how to walk with it on. Many people also find it equally effective being worn on the inside ankle of the weak hand. If you have any questions about ankle rigs, feel free to either give us a call or email us as we’ll be glad to try to help.